Fra Junípero Serra (November 24, 1713 – August 28, 1784) was a Spanish Franciscan friar who founded a mission chain in Alta California and is remembered both for his effective missionary work and his courageous insistence on the rights of Native Americans. Serra joined the Franciscans and entered the Order of Friars Minor in 1730. Recognized for his proficiency, when was only 18 years old, he was appointed as lector and taught philosophy before entering the priesthood in 1738. Later, he received a doctorate in theology from the Lullian University in Palma de Mallorca, in Majorca, Spain. He traveled to Mexico City in 1749 and worked as a missionary and preacher in central Mexico until 1767. As Spain moved to claim what is today California, he led a group of Franciscans there, where he personally founded Mission San Diego and eight additional Franciscan missions. He and his fellow friars founded 21 missions in all, converting a large proportion of the local native Americans, strengthening Spain’s control of the area. A supporter of human rights, Serra was often in conflict with Spanish military leaders over their treatment of his converts. In 1773, Serra brought a successful case against the military governor of New California on grounds of corruption and abuse. Serra was beatified by John Paul II in 1988, but his canonization as a saint was opposed by segments of the Native American population. They charged that, as part of the Spanish colonial system, he disrupted native culture and exploited the native people for Spain's economic advantage. He is, nevertheless, highly respected in California, where numerous monuments have been erected in his honor. Serra was born Miguel José Serra in Petra, Majorca, Kingdom of Spain, on November 24, 1713. He later took the name of "Junípero" in honor of Saint Juniper, a disciple of Saint Francis. On September 14, 1730, he entered the Order of Friars Minor. He was a proficient student, and was appointed lector of philosophy before his ordination to the priesthood in 1738. 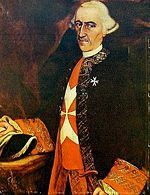 Later, he received a doctorate in theology from the Lullian University in Majorca, where he also occupied the Duns Scotus chair of philosophy until he joined the missionary College of San Fernando de Mexico in 1749. That year he traveled to North America, first to Mexico City, where he taught. While riding on a mule from Vera Cruz to the capital, he seriously injured his leg, so that he suffered from pain throughout his life. He nevertheless tried to make his journeys on foot whenever possible. Serra soon requested a transfer to the Sierra Gorda Indian Missions some 90 miles north of Santiago de Querétaro where he spent nine years. During this time, he served as the mission's superior, learned the language of the Pame Indians, and translated the catechism into their language. Recalled to Mexico City, he became famous as a fervent and effective preacher. His zeal frequently led him to employ extraordinary and dramatic means in order to move the people to repentance: He would pound his breast with a stone while in the pulpit, scourge himself, and even apply a lit torch to his bare chest. Extreme as these practices seem today, they often brought his native listeners to tears as they became convinced of his humility as a penitent and his absolute devotion to God, as well as his commitment to bringing the Gospel to them. Fr. Serra rejoices over the arrival of a much needed supply ship in San Diego. In 1767, Serra was appointed superior of a group of 15 Franciscans who were mandated to expand the Indian Missions of Lower California. The Franciscans took over the administration of the missions on the Baja California Peninsula from the Jesuits after King Carlos III ordered the Jesuits forcibly expelled from "New Spain" on February 3, 1768. On March 12, 1768, he embarked from the Pacific port of San Blas on the Mexican mainland on his way to the Californias. Early in 1769, Serra accompanied Governor Gaspar de Portolà on an early expedition to Nueva California. On the way, he established the Misión San Fernando Rey de España de Velicatá, on May 14, the only Franciscan mission in all of Baja California. When the party reached San Diego on July 1, Serra stayed behind to start the Mission San Diego de Alcalá, the first of the 21 such missions in California founded by Serra and his fellow Franciscan missionaries. Mission San Juan Capistrano, thought to include the oldest standing building in California. 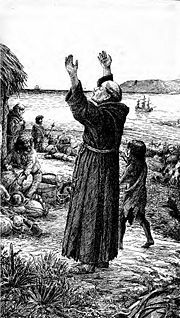 Inspired by the Franciscan spirit of humility and service, the missions met with remarkable success, accomplishing the conversions of the majority of the natives on the Pacific coast as far as north as Sonoma, although not without sometimes violent resistance, notably at San Diego in 1774. When he reached Monterey and founded Mission San Carlos Borroméo de Carmelo, Serra remained there as "Father Presidente" of the Alta California missions. In 1771, he relocated this mission to Carmel, which became known as "Mission Carmel" and served as his headquarters. Under his leadership were founded Mission San Antonio de Padua, Mission San Gabriel Arcángel, Mission San Luis Obispo de Tolosa, Mission San Juan Capistrano, Mission San Francisco de Asís, Mission Santa Clara de Asís, and Mission San Buenaventura. Serra was also present at the founding of the Presidio of Santa Barbara on April 21, 1782, but was prevented from locating the mission there because of the animosity of Governor Felipe de Neve, with whom he often quarreled over the issue of the treatment of the natives. Viceroy Antonio María de Bucareli y Ursúa sided with Serra in his dispute with California's military governor Pedro Fages. Serra was well acquainted with the writings of Bartolomé de Las Casas, who argued that native peoples deserved to be treated as full human beings with all attendant rights. These views, however, put him at odds with the Spanish military government, which exploited the labor of the Indians and often took the view that human rights were a luxury which Spain could not afford to grant to the native peoples. Serra, who held that as baptized Christians, the Indians held the same rights as other Spanish citizens, grew increasingly frustrated with the abuse of his converts by Spanish soldiers and the corrupt leadership of the military governor of New California, Pedro Fages. In 1773, Serra traveled to Mexico City to argue before Viceroy Antonio María de Bucareli y Ursua for the removal of Fages as the governor and to set forth, in effect, a bill of rights for the natives. He drew up a Representación consisting of 32 articles, and Bucareli ruled in Serra's favor on 30 of these points, removing Fages from office in 1774. Serra then returned to California, and in 1778, he was authorized to administer the sacrament of confirmation for the new faithful. After he had exercised his privilege for a year, however, the new governor, Felipe de Neve, directed him to suspend administering the sacrament until the matter could be resolved by the Vatican. For nearly two years Serra refrained, until Viceroy Martín de Mayorga Ferrer determined that Serra was within his rights. During the remaining three years of his life, Serra once more visited the missions from San Diego to San Francisco, traveling more than 600 miles in the process, in order to confirm all who had been baptized. He suffered intensely from his crippled leg and also in his chest, but he would use no remedies. He is recorded as having confirmed 5,309 persons, who, with only a few exceptions, were Native Americans converted during the 14 years from 1770. On August 28, 1784, at the age of 70, Father Serra died of a snake bite at Mission Carmel and was buried there under the sanctuary floor. A statue of Father Junípero Serra blessing a Juaneño Indian boy, sculpted by Tole van Rensalaar and commissioned in 1914. Junípero Serra was beatified by Pope John Paul II on September 25, 1988, the first step towards canonization, or promotion to sainthood, in the Roman Catholic Church. Some Native American groups are opposed to this, however, claiming that the missions mistreated their people and seriously disrupted native culture. The chapel at Mission San Juan Capistrano, built in 1782, is believed to be the oldest standing building in California. Known as "Father Serra's Church," it has the distinction of being the only remaining church in which Father Serra is known to have acted as priest, presiding over the confirmations of 213 people on October 12 and October 13, 1783. Many of Serra's letters and other documentation are extant, the principal ones being his Diario of the journey from Loreto to San Diego, which was published in Out West (March to June 1902) along with Serra's Representación. A bronze statue of heroic size represents him as the apostolic preacher at Golden Gate Park in San Francisco. Jane Elizabeth Lathrop Stanford, wife of Leland Stanford, governor and U.S. Senator from California, although not a Catholic herself, had a granite monument erected to honor Father Serra at Monterrey. In 1884, the Legislature of California passed a concurrent resolution making August 29 of that year, the centennial of Father Serra's burial, a legal holiday. A statue of Friar Junípero Serra is one of two statues that represents the state of California in the National Statuary Hall Collection in the U.S. Capitol Building. It was sculpted by Ettore Cadorin and depicts Serra holding a cross and looking toward the sky. When Interstate 280 was built in stages from Daly City to San Jose in the 1960s, it was named the Junipero Serra Freeway. There is also a statue of Serra along the freeway in Hillsborough, California. The statue stands on a hill on the northbound side and has a large pointing finger facing the Santa Cruz Mountains and the Pacific. Santa Barbara, California, has a street named Alameda Padre Serra (Father Serra's Street) that runs from the Mission Santa Barbara along the foothills in the city. San Diego, California, has a street named Father Junipero Serra Trail that runs through the Mission Trails Regional Park to Santee, California. Ainsworth, Katherine, and Ed Ainsworth. In the Shade of the Juniper Tree; A Life of Fray Junípero Serra. Garden City, NY: Doubleday, 1970. OCLC 66953. 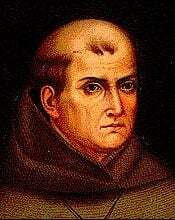 Couve de Murville, M. N. L. The Man Who Founded California: The Life of Blessed Junipero Serra. San Francisco: Ignatius Press, 2000. ISBN 9780898707519. Sandos, James A. Converting California: Indians and Franciscans in the Missions. New Haven: Yale University Press, 2004. ISBN 9780300101003. Weber, Francis J. Blessed Fray Junípero Serra: An Outstanding California Hero. Strasbourg, France: Éditions Du Signe, 2007. ISBN 9782746818965. This page was last modified on 12 September 2016, at 15:49.